It was at that time that I began this blog to help out with working through ideas in my dissertation, which, as you can see from my few posts, means that not much got posted. I tend to work things out about halfway and then write about them rather than just brainstorming here. Instead, this has become a sort of professional blog in general with a strong inclination towards all things Ormulum. Just check out my Ormulum Translations (and the dropbox titled that in the menu) on this site to see how much Orm has dominated it. Another blog that I began shortly thereafter was my pedagogy blog, Finding My Method, because I was so frustrated with the utter lack of pedagogical support and training in my department. Unfortunately, I don’t think any of my classmates ever look at it, which is why I began it in the first place–Florida State University, where I earned my MA, used to have a blog that its graduate student instructors used to help each other with lesson plans, rubrics, classroom exercises, assignments, and so much more. I don’t know if it still exists, but I do know that the FSU English department now has the Inkwell in the form of helpful guides/examples/tips for different elements of teaching in the college composition classroom. All of these come from their own graduate student instructors, which is incredibly useful and makes teaching at the college level seem much less daunting (this coming from a woman who first taught 18- and 19-year-olds in college at the age of 22; it’s terrifying and exciting all at once). From there, I started to explore more. What exactly was Academia.edu? Well, it turns out that it’s like Facebook for academics, but better. So, obviously, I created an account. Same went for LinkedIn, which isn’t as useful academically as Academia.edu. I did, however, contact the brilliant Michelle Brown that way, and she treated me to lunch in London while I was staying there in 2012. That’s something! 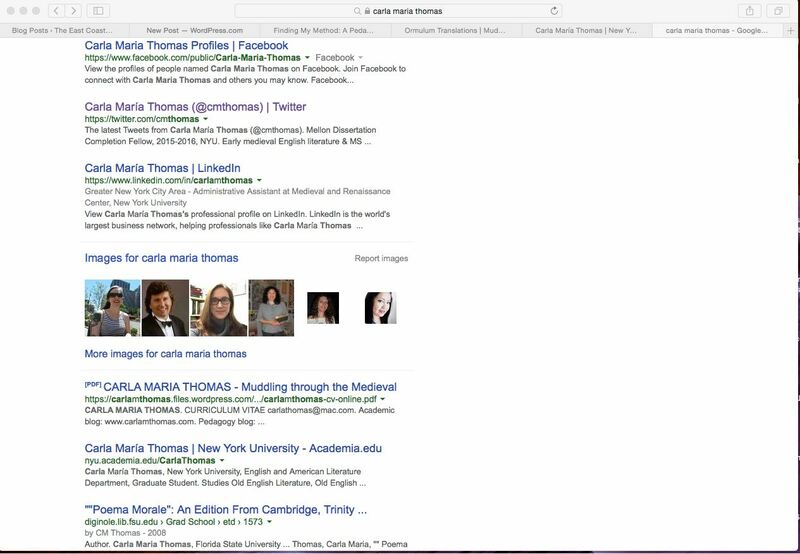 Now, when I search “Carla Maria Thomas” in Google, the first six links take me to ME! You’ll notice that the first five of the six are all sites that I control: Facebook, Twitter, LinkedIn, and my two blogs. The sixth one is my MA thesis, so, sure, I had some control over that seeing as I composed it, but ultimately FSU controls what it does with it. This is the sort of careful cultivation of an online presence that my professor meant, and I’ve taken great care to nurture it, censuring myself on some sites and just being myself on others (after all, you have to be “friends” with me on Facebook to see my posts and such). Thanks to the amazing Elaine Treharne’s project of Beowulf in 100 tweets (#Beow100), I had some inspiration to start tweeting my translations of the Ormulum (#ormulum #OrmLOVE). Not only would a translation finally be available, but Twitter would also provide immediate access to it and the reason why I would not give up on the project. Sure, maybe five people care about it (not just on Twitter but in the whole world), but hey! I would provide! Initially, I considered doing a condensed version of tweeting, like Elaine was doing for Beowulf, but then I realized that that would be doing Orm a major disservice, especially since this would be the only current translation. After all, his repetition is one of the things that make his verse-homilies the Ormulum that I love and that so many people love to hate! This is how my blogging also became a little more frequent because I realized that nobody wants to go through all my tweets to read a full homily, not even me. Sure, you could Storify a particular homily hashtag (e.g., Homily 7 = #ormulumh7), but why bother? For that reason, I began collating my tweets into one Word document per homily (I actually type all my tweets up in a document titled “Twitter Orm” before tweeting so I can meet the character limit as well as copy and paste into Twitter). Then, after the homily is fully translated and tweeted, I post the homily, slightly revised for the blog medium, on my professional blog, the link for which I then share on Facebook and Twitter. Tweeting and blogging these translations, and having discussions with other scholars about Orm’s weird genius on Twitter, is how I’ve become known as “the Ormulum girl.” (I promise to one day dress up as a superhero of that title for Halloween. Just you wait. There will be photographic evidence.) But I’ve also realized something very important for myself and my sanity: I enjoy translating. For me, translating is relaxing. It’s a break from the intellectual rigor of writing a dissertation, of the social rigor of organizing (my friend and I are in the middle of organizing the Fifth Annual Medieval Manuscripts Workshop as well as all our guest speakers this coming year), and, eventually, of the bureaucratic rigor of applying for jobs. I once told my dissertation director (the brilliant and amazingly generous Haruko “Hal” Momma) that I was going to take a break from dissertating for a week since I had just turned in a chapter to her, and all I was going to do was translate the Ormulum in my neighborhood coffee shop that week. So, for me, falling into the language and homilies of Orm’s world is a way of escaping, of participating in social media in a way different from live-tweeting conferences (which is/can be exhausting) or Facebooking, of doing the one thing I ever really want to do: play. This entry was posted in Uncategorized and tagged Academia.edu, early Middle English, Facebook, LinkedIn.com, medieval, Ormulum, professionalization, social media, translation, Twitter. Bookmark the permalink. Thanks for writing this: your google screen cap is the best summary of why an online presence matters so much. I’ve only just stumbled across your blog and haven’t seen any of your translations, but tweeting a translation sounds a fascinating way of approaching a text most people wouldn’t know. Very inspiring! Thank you, Carla! I appreciate it. I organized and moderated a roundtable on using Twitter in medieval scholarship and pedagogy at a conference in Leeds a few weeks ago, so I thought I’d post my own thoughts on my blog. 🙂 I’ve also found that tweeting the translation helps me analyze the text better, too. It’s a win-win!